Globally, the health care organizations are under resource and cost constrains due to the increasing number of patients that are due to a fast increase of the 65+ age group requiring extensive medical hospitalization and treatments. Hospitals worldwide strive to seek the best cure for patients, suffering from various diseases. A consequence of these global changes, of healthy populations in relation to patients forms the basis for the build of large and centralized biobank facilities, with strategies where the search for an understanding of diseases at a molecular level is at heart. The efforts made lies within large governmental resource allocations where patient centers are collecting samples from clinical study participants in order to try to discover universal expression patterns and molecular signatures of disease and disease stages. Most developments in this area are aimed towards the discovery, and understanding diagnosis implementations. By providing the right treatment alternatives for patients care, at the right time point i.e., at a given disease stage development becomes a major goal where pharmaceutical industry, academia and the health care sector joins forces in large clinical epidemiological, population-, and disease based studies. This becomes a clear strategic link to the enhancement and prospects for personalized medicines and target directed diagnosis developments (Companion Diagnostics), which require coordinated efforts across a wide range of disciplines. Currently, companion diagnostics is at the core of the personalized medicine paradigm shift. It will identify patients who are most likely to benefit from a particular therapeutic product, as well as identify patients likely to be at increased risk for serious adverse reactions as a result of treatment with a particular therapeutic agent. It is predicted that more than half of all new drugs will require a companion diagnostic, which opens up for an endeavor for Proteomics research implementations. Global healthcare changes forms the basis for the rapid development of centralized large scale biobank facilities, with strategies to improve on patient status at hospitals where limited resources are at hand[1, 2]. Finding the [atient group of responders to a given medical treatment is hospitals today is a major challenge. Especially as we are entering a period of targeted drug treatments. The consequence is that large clinical epidemiological, population-, and disease based studies are undertaken to get an overall higher efficacy as well as an improved safety assessment where Companion Diagnostics will play a major role[3–5]. Biobanks were found to be within the ten ideas changing the world right now. Biobank repositories requires biobank sustainability where adequate staffing, including pathology support is integrated into the health care organization of hospitals. The molecular value of information that is the treasure of a biobank is illustrated in Figure1. Schematic illustration of the molecular targets and drivers that will form the basis for future drugs and diagnostics in hospitals throughout the world. Blood fractions from patients comprising whole blood, serum, plasma (EDTA, citrate, and heparin) are being stored and processed by automated processing in -80C storage units. High-density sample tube systems are applied to maximize the sample output per patient utilizing 384-rack systems. Bar code assignments ensure the uniqueness of each and every sample that is used within the analysis process generating both MS-MS and antibody read-outs. 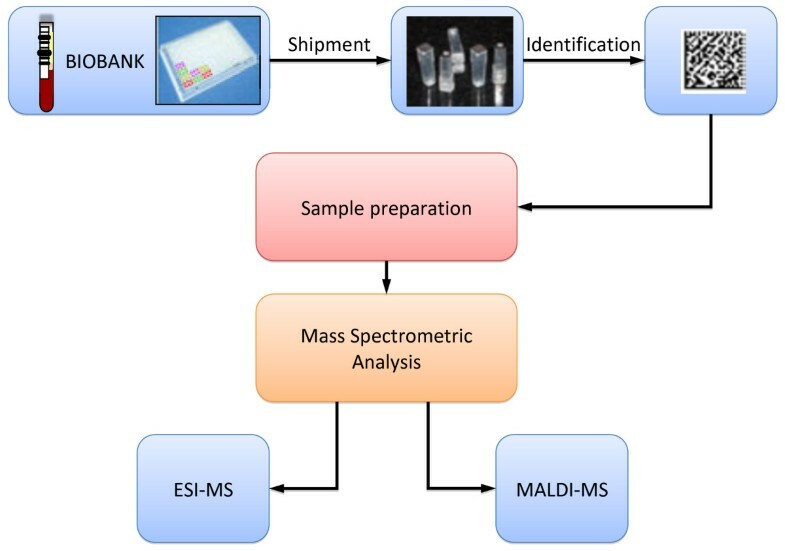 The workflow and processing of Biobank samples to generate extensive protein sequence information in health and disease is outlined in Figure2. 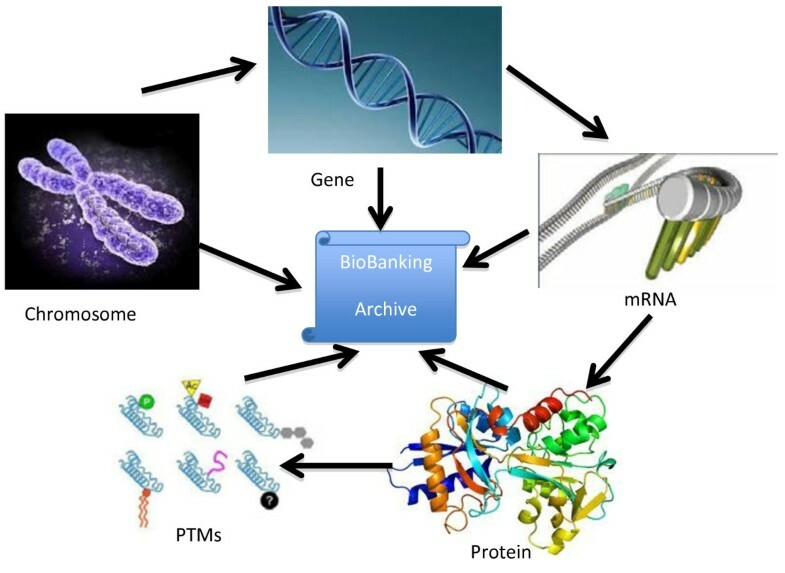 Biobank work flow where large scale Biobanks are utilized for high-throughput protein sequencing using mass spectrometry platforms. The current status of healthcare requests and demands can be summarized by that currently more than 7,000 rare diseases affect human mankind and less than 200 have available pharmacotherapy. Considering an estimated number of 20,300 proteins within the Human Proteome, coded by the genome, will increase and reach into several million proteins after cellular processing, the key protein targets to be considered is a real challenge. Thus, the C-HPP consortia deliveries over the next coming years will be instrumental in these development programs. These difficult healthcare issues will entail large number of biobank samples with ample statistical power. Worldwide biobank archives will need to work together and exploit these cohort sample assets in order to generate value in future science milestones that will transform value to the patient. Biobanks of human patient samples tissues and blood fractions are increasingly recognized as major assets in disease research[9, 10]. These new sample archives are built within both academic, commercial health care, the drug development industry, as well as within the government regulating agencies. All these efforts are performed in order to reach goals where these efforts are turned into value for the patient. Standardizations of quality control of samples being processed for storage as well as retrieval of stored samples are important goals in order to support the development of both drug targets as well as diagnostic tools such as biomarkers. Currently the highest unmet need in modern healthcare is the monitoring and prediction of response to treatment. The optimization of drug treatment that easily can be adjusted for by scheduling the dosing, discontinuing, the drug treatment, and thereby optimize and improve on the safety and/or efficacy of a targeted drug treatment[11, 12]. Consequently, the status today is that the lack of available high quality sample collections with a wide range of disease cohorts currently is a rate-limiting step for drug development, medical research and novel diagnostics. The targeted Personalized Medicine developments ultimately will need to align with the increasing safety demands that are key for preventive medicine and early treatment. Another challenge for new drug developments, where the C-HPP deliveries can play a role are disease phases and complex patho-physiology that needs to be understood for any given treatment. Translating basic science to discover new and better treatments is an enormous challenge where the understanding of protein function(s), both as targets as well as biomarkers will bring great value in the near future to come. This includes the missing proteins (currently about 30% of the human proteome) that have not yet been identified on a protein level but predicted from DNA, or identified as transcripts. Another area where the C-HPP will have an important role to play is within the area of the future healthcare with drug and diagnostic developments for novel treatments of complex diseases. The future direction envisions that large studies will be accompanied by, biological-, and molecular- information and corresponding material from large numbers of patients and healthy persons, where the protein data from large biobank archives will play a mandatory role. Accordingly, there is a call for further develop value and treasure that biobanking holds with a global approval on the quality, standardization and the organization of modern units being developed for future use. There are also demands and expectations from national agencies on quality for a successful usage of biobank materials, particularly in the area of novel drug developed with accompanying diagnostics introduced into the hospitals. This work was supported by grants from Mrs. Berta Kamprad Foundation, Swedish Academy of Pharmaceutical Sciences, Swedish Research Council, the Swedish Foundation for Strategic Research, Vinnova, Ingabritt & Arne Lundbergs forskningsstiftelse and the Crafoord Foundation.